Summerland is a game about redemption is a post-apocalyptic world destroyed by a vast forest. The game was first published nearly ten years ago, and has since been translated in to French, Catalan and Spanish. 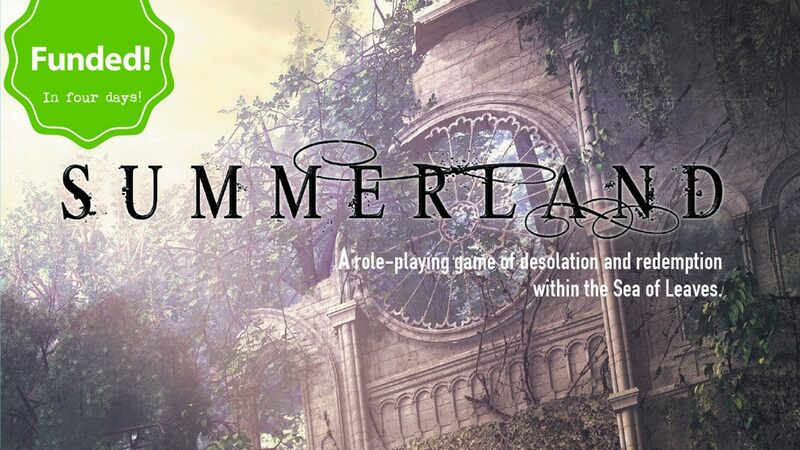 In Summerland, players take on the roles of Drifters, characters who travel beneath the Sea of Leaves, the vast supernatural forest that has devastated the works of humanity. They are driven to constantly move on due to a past trauma that while protecting them from the Call, the siren-song of the forest, prohibits them from being accepted in to what's left of society. Instead they must confront their past, resolve their trauma and at last join the remainder of humanity. This new version of Summerland uses mechanics specifically to model the process redemption, giving the game a clear 'end-game' linked to actual play. This Kickstarter is to fund the creation of a new full-colour version of the game with improved mechanics based on the Open D6 system, in 200 page 6"x9" book format. The Kickstarter is already funded, so it's now stretch goals all the way! As the blurb said, the campaign has reached its funding goal, so it's onward through stretch goals for the next 24 days.